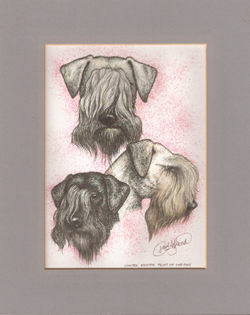 Naturally we like to collect artwork and memorabilia with a Cesky Terrier theme! 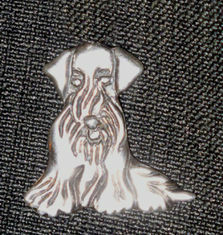 The Cesky Terrier logo has been in use since the very early days of the breed. 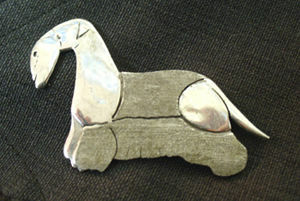 I bought this silver pendant at Cesky Days in Hrdonov and have worn it ever since. 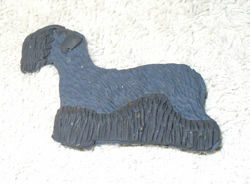 This one came from the very first Cesky Days, held at Veltrusy on the bank of the River Vltava in Northern Bohemia. 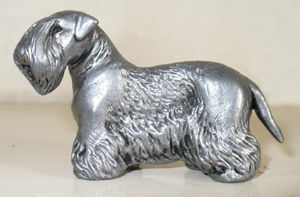 A much more modern depiction of a Cesky Terrier - this is a souvenir of my visit to the World Dog Show in Denmark in 2010. 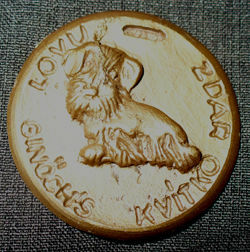 Jitka Paulinova gave me this medallion, commemorating her Kvitko kennel, alongside her father's Lovu zdar affix. 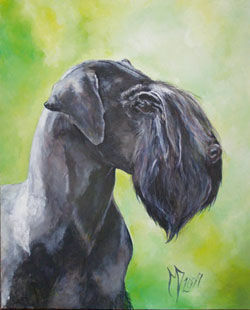 Czech artist, Oldrich Dufek, is a lover of the breed and often includes his own Cesky Terrier in his work. When art materials were difficult to obtain during the Communist era, he used coffee as a pigment - this drawing of Ridley Iza is done in that medium. 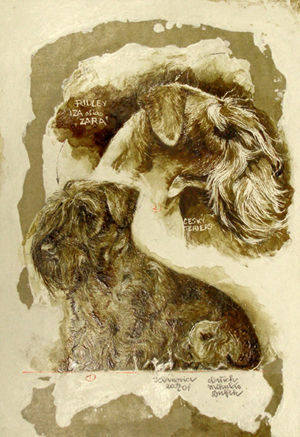 Paul Adshead, who owned Ridley Fletna von Manderley, painted this for me as a present for Jitka Paulinova - it depicts three of her best known Cesky Terriers - Ben Prasek, Chyba Kvitko and Kulicka Kvitko. In a very different style is this painting of Gloria Kvitko, done in acrylics by Michael Peach. 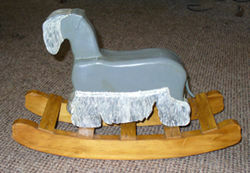 I bought this model at Brno International Dog Show one very cold, snowy February. 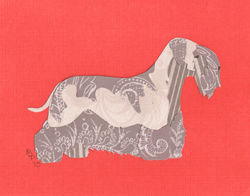 This pretty 'Canine Cut-up', designed by Patricia Peters, was a gift from Harold and Liz Gay, importers of the first Cesky Terriers into the UK. 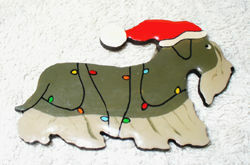 They also gave me the fun Christmas Cesky Terrier. Both come from the USA. 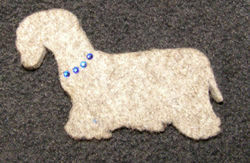 The funky blue brooch was made in the Czech Republic by Petra Harmackova and was a gift from Sabina Kocanova at Crufts 2019. 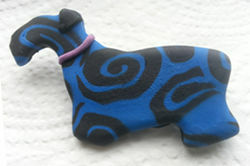 Hannah Thompson, a talented British artist made this more traditional model of Nina in the same medium. 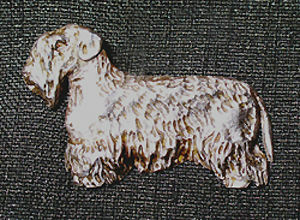 The felt Cesky Terrier, with his collar of Swarovski crystals is the work of Jitka's daughter-in-law, Lucie, whilst talented Regine Royer gave me this lovely keyring she had painted, a memento of Pamatka's BOB at Kortrijk that day. Practical as well as beautiful - the little pegs hold all sorts of reminders of things to do, and the hanger was itself a present from my good friend Emanuela Tassi. 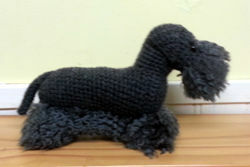 The lovely crochet figure was a gift from Nichola Moore, and is a reminder of time spent in Ireland, whilst the Cesky Terrier rocker was made in Canada. 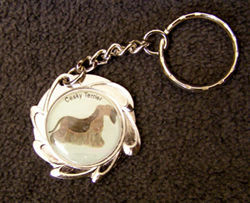 We started this page with items bought at the first Cesky Days. The twenty-fifth meeting of Cesky friends from around the world was held in 2017. 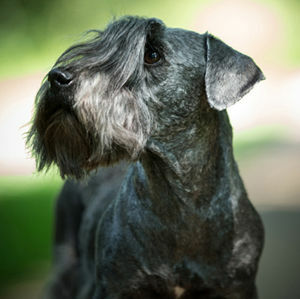 It marked Pamatka's retirement from the show ring. She went out on a high, winning not only the Honour Class, but also the Horak Memorial competition. I chose this piece to remember the occasion. 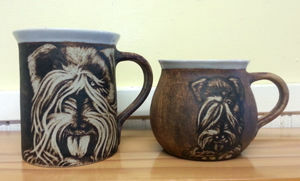 And since you can never have too many coffee mugs..... these came home from Cesky Days as well. When Pamatka qualified for the Champion Stakes final, part of her prize was a photo shoo with the talented Lisa Croft-Elliott. Of all the images taken that day this is my favourite. 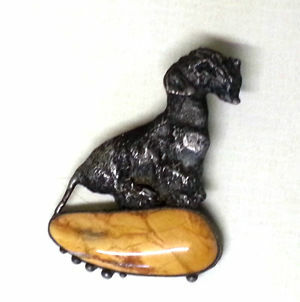 Enlarged to more than twice her size, it was displayed in the ring at the finals. 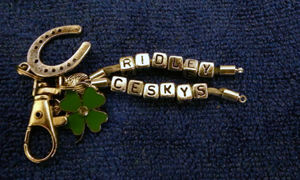 These are a few of our Ridley Treasures, pieces that are extra-special to us as they all bring back wonderful memories.